Rupert Pupkin Speaks: Arrow Video - PHANTOM OF THE PARADISE on Blu-ray ""
THE ROCKY HORROR PICTURE SHOW is sort of a prototypical cult film. I've never particularly been a huge fan of the movie, but it is quite a remarkable phenomenon for sure. The passion shown by ROCKY HORROR fans in their decades upon decades of attending midnight screenings of the 1975 film is quite an outpouring of affection to say the least. 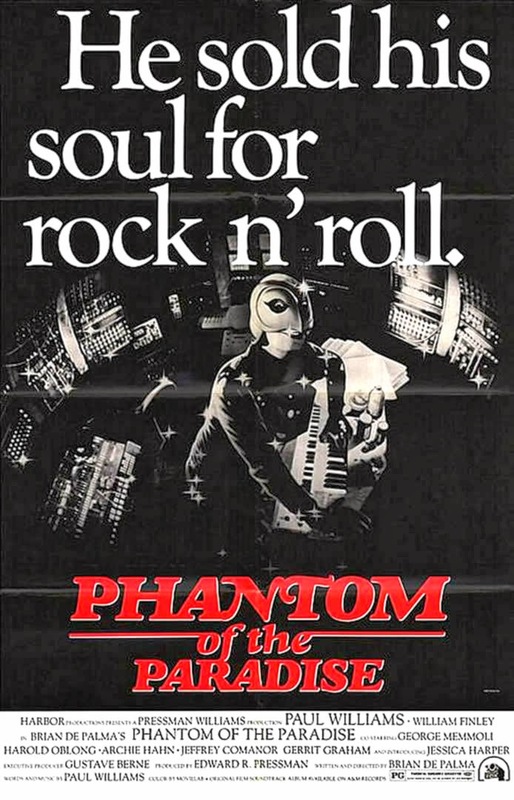 Brian De Palma's film PHANTOM OF THE PARADISE came out circa October 31st in 1974 (a little over a month after I was born). I have an odd curiosity about things that emerged in the culture just as I was coming into the world. The week I was born, the PLANET OF THE APES TV Series aired for the first time. I've always thought that was kinda cool. Even cooler though is that some folks were seeing PHANTOM in what was probably a small group of theaters so soon after my birth. It gives me some tenuous connection to a film I've come to love very much. I have been fascinated with the idea of cult films for a very long time. When I first picked up Danny Peary's book Cult Movies it changed my life (as did his other books). I was immediately taken in by the idea that movies could be loved and shared so passionately from person to person over many years. I had to see these movies to see exactly why they were so special. 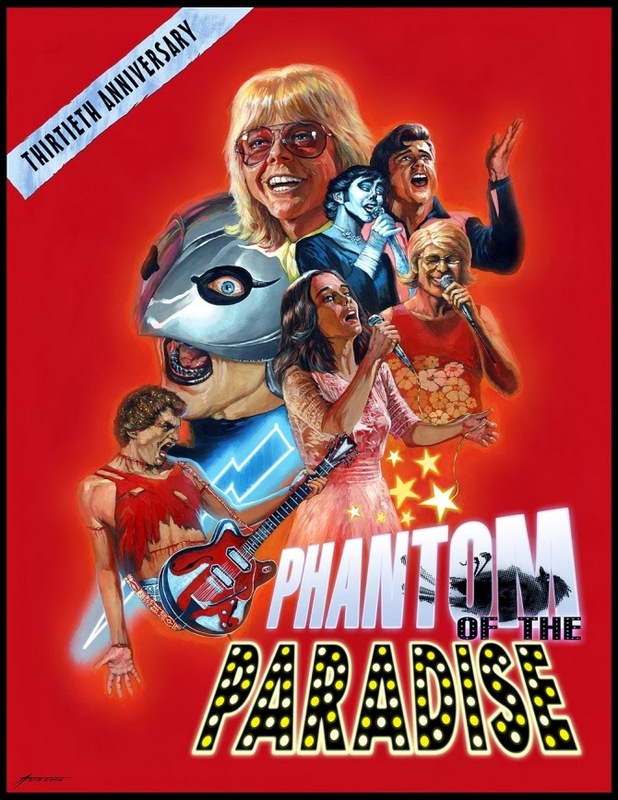 PHANTOM OF THE PARADISE was one of those movies (Peary didn't discuss it until Cult Movies 2, but I got all of the books at once so I came across it right away). I was aware of De Palma at the time, but had no idea he was capable of something like this. His musical collaborator Paul Williams was clearly a big part of what made PHANTOM so amazing and different than any of De Palma's other films. Williams is, for me, one of the great songwriters of all-time. Up there with Paul Simon, Bob Dylan and my contemporary favorite Stephin Merritt. PHANTOM is such an explosively awesome melding of story, production design, music, visuals and great actors. I have gotten a bit cynical as I've gotten older and started to realize just how difficult it is for films to get made in general, let alone GOOD films. 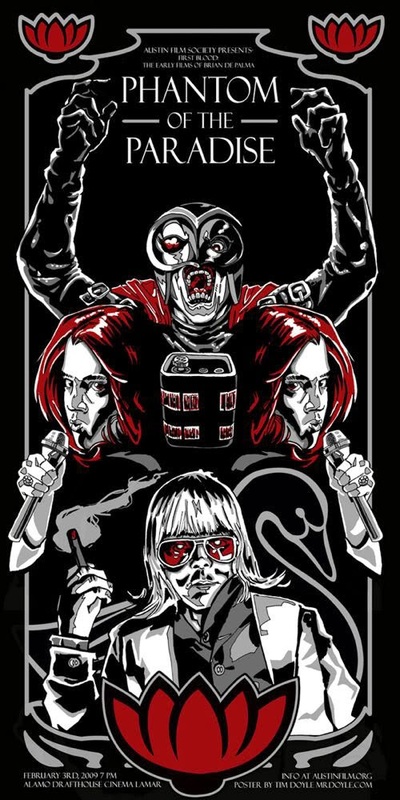 So for something like PHANTOM OF THE PARADISE to exist is quite a coup. A lot of cult films are these wonderful little miracles where a whole bunch of things align perfectly and it is so glorious to know that they can and have happened. I often find myself comparing PHANTOM to ROCKY HORROR and lamenting the fact that one is this mega-cult favorite and the other is a much more meager cult classic these days. Still, PHANTOM has some seriously devoted fans, not the least of which is director Guillermo del Toro (who makes an appearance in the supplements of this Arrow Blu-ray). 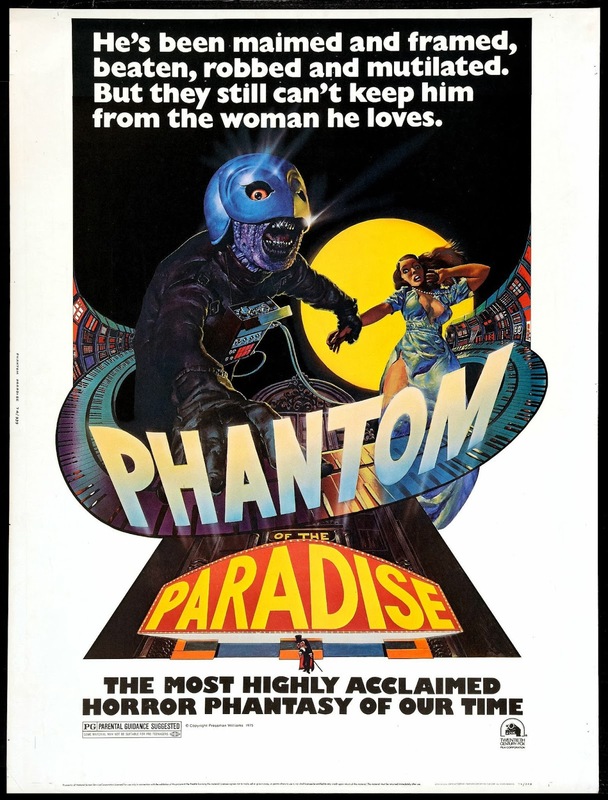 For some reason, it hadn't dawned on me immediately upon seeing it that Nicolas Cage's Big Daddy mask in the film is a dead ringer for Winslow's mask in PHANTOM OF THE PARADISE. It clearly is. Cage said as much in his interaction with Drew. I love this story because I am already a Cage fan and the fact that he credits PHANTOM OF THE PARADISE with him wanting to make movies is pretty spectacular. 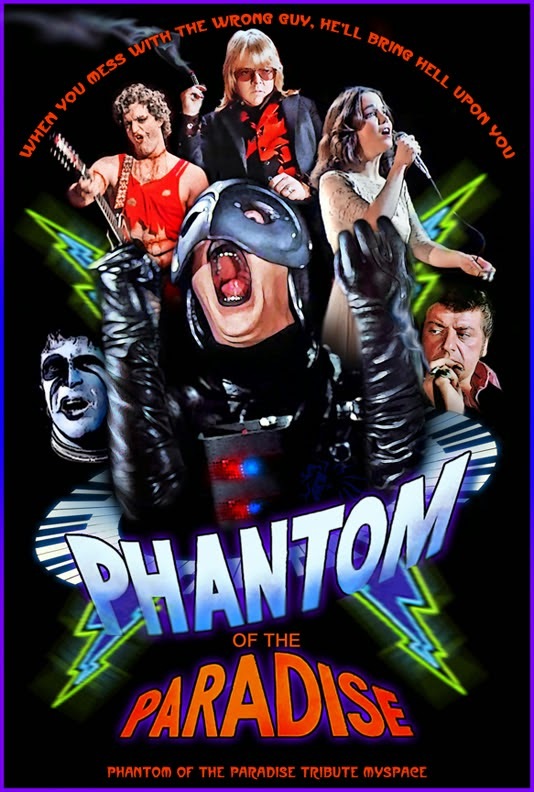 I just love the story as another example of what a cult movie is and how strong the power of PHANTOM is over those that have discovered it for themselves. That coupled with the idea that the Phantom himself might have been an influence on one of the most recognizeable icons of our culture today(Darth Vader) is even more gratifying. --Paradise Regained: A 50-minute documentary on the making of the film featuring director Brian De Palma, producer Edward R. Pressman, the late star William Finley, star and composer Paul Williams, co-stars Jessica Harper and Gerrit Graham and more! -> Outstanding retrospective doc. Great to hear De Palma talk about the movie. --All new 72-minute interview with Paul Williams by Guillermo del Toro. -> This is just fantastic. Your really couldn't ask for much more from a supplement to a disc like this. --William Finley on the Phantom doll! --Collector’s booklet featuring new writing on the film by festival programmer Michael Blyth and an exploration of the film’s troubled marketing history by Ari Kahan, curator of SwanArchives.org, illustrated with original stills and promotional material.